Home » Keurig K575 vs. K525: Which is best for you? In the ever-expanding universe of Keurig brand single serve brewers, it’s easy to see how consumers can become confused as to which of the many models currently available is best suited for their personal needs. 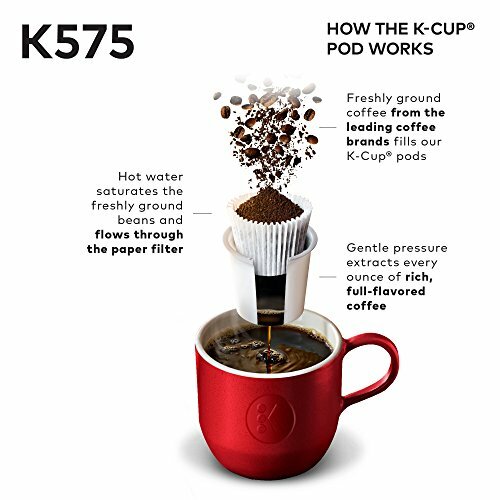 So leave it up to the good folks over at Keurig to muddy the waters even more with the recent introduction of their latest versions, the K525 and the K575. At first glance, both units appear to be quite similar to one another, and you’d be right for thinking that. The packaging looks the same, both machines come in a handsome aluminum color that will look great amongst all of your other kitchen gadgets, and each brews the same wide assortment of delicious beverages from all of the great companies already producing pod products. Which should you invest your money in? The solution to your problem is a lot clearer than you could ever imagine. There’s no mistaking that Keurig reigns supreme as the king of the hill in the single serve coffee space. All of their products represent a marriage of convenience and functionality that consumers have come to appreciate and, while you can expect top-notch performance from any of their brewers, they really pulled out all the stops with the K525 and K575 models. Both models have an outstanding assortment of of bells and whistles, and represent a top of the line brewer that stands head and shoulders above all other K-models currently available. If you were to open up each unit and toss away the attractive plastic exterior shell, which we certainly don’t recommend should you wish not to render your warranty null and void, what would lie in front of you would be two piles of machinery that mirror one another. Rather odd, admittedly, but don’t forget that these units are the embodiment of Keurig’s commitment to producing a premium brewer. They operate quieter and faster than previous iterations, a feat that certainly carries a steeper price tag along with it. The physical footprint of each brewer is also the same, with each machine measuring in at 10.43”L x 13.63”W x 13.45”H, and with a weight just shy of about 14 lbs. 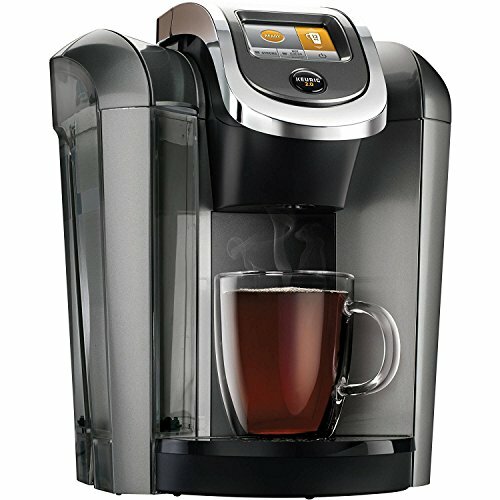 The K525 K525 and K575 are the convertible of Keurig’s line of home brewers, and sitting next to each other in the garage, they purr right along like a well-oiled machine. Whether you need an early morning cup to get you out the door or a piping hot pot for Sunday brunch with the in-laws, both machines are ready to deliver. Each brew a variety of sizes in the 4-30 oz. range, and are compatible with all the same products currently accepted by all the other 2.0 models. That includes the standard K-Cup, as well as the K-Mug, the since-discontinued Vue pods, and the K-Carafe pods. However, neither brewer comes with a carafe in the box, so make sure to pick one up if you plan on using that option. And since the My K-Cup reusable filter works with both units, you may want to consider grabbing one of those as well if you want to brew your own favorite loose coffee. When comparing the size of the water reservoir, you’ll find that both the K575 and K525 utilize a whopping 80-oz tank. 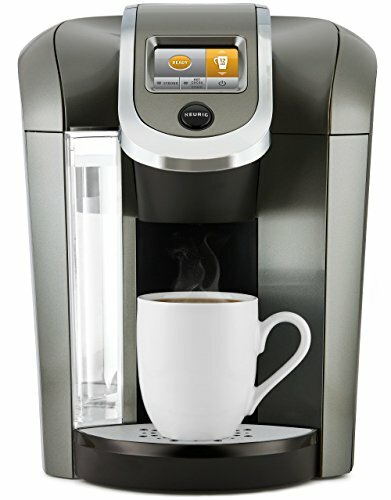 It’s the largest available for any of Keurig’s home brewers, and trumps the next largest option, found on the popular K475 unit, by a full 10 oz. With that much water ready to disperse at a moment’s notice by way of the touchscreen controls, you’re always less than a minute away from a steaming hot mug of your favorite beverage. Both models also feature a wide array of customizable options, some of which are only native to the K525 and K575. This includes strength control, adjustable water temperature, hot water on demand, a large and easy-to-read touchscreen that can be jazzed up with a bit of color from the assortment of available wallpapers, and a night light feature. One particularly useful feature is the inclusion of a programmable digital clock. Simply tell it what time you want to have your beverage ready, and it takes care of the rest. It sure makes Monday mornings a little more tolerable when you know that your favorite drink will already be waiting for you. If you’ve been following along, you’re probably scratching your head and wondering at what point one of these machines is going to stand out from the other and become the clear-cut winner. The answer is coming soon enough, but it’s not with the price tag of either unit. Depending on where you shop and any sort of promotions running at the time, each unit comes within about $50-$75 of each other. Now, since this is the crème de la crème of Keurig home brewers, they’re still going to set you back a little more than some of the other models. But any astute shopper should be able to snag one in the sub-$200 range with no problem. Having gone down the list and compared each unit side-by-side, I was still perplexed as to what could possibly distinguish the K525 brewer from the K575 model. They were identical inside and out. They looked the same, functioned the same, and both could brew a delicious cup of coffee. But surely that had to be some feature, some fantastic something that would lead Keurig to manufacture two separate units, create the appropriate packaging, and force retailers to load another pricing SKU into their already gargantuan inventory systems. So I reached out to Keurig themselves via their online chat feature, and a rather pleasant representative informed me that, indeed, each model is exactly the same. However, the K575 model comes packaged with a water filter kit. Not a feature, or a color swap or some other mind-blowing concept that would set one unit apart from the other, but the simple inclusion of a water filter. Turns out that back when both units were readily being produced and marketed as two separate products, the K575 model would come bundled with a water filter handle and two filter cartridges. The K525 would not. And in keeping with simple economics, the more stuff that’s crammed in the box, the higher the MSRP. A small, almost minute difference between the units for sure, one that most people would be forgiven for not noticing. But a detail nonetheless that Keurig felt warranted the production of another bundle. Now this wasn’t necessarily a bad thing, or even an attempt from the coffee giant to pull a fast one over on unsuspecting customers. It’s a common practice that manufacturers of physical goods have been engaging in for years. The difference here, however, is that when consumers are typically presented with products that include bundled options, it’s generally made very evident with some sort of special wording on the package. Keurig didn’t choose to go that route. Instead, the packaging produced for both the K525 and K575 are nearly identical. The wording on their own site only makes a very minor reference to the fact that one includes the water filter. And the Keurig faithful have come to expect that when the company releases a new model and slap a new number on the box, that there’s often a new set of features that accompanies it. But that just wasn’t the case this time. Although both units are the exact same brewer and the only difference is the inclusion of a water filter, the choice of which one to buy may already have been made for you. You see, it’s quite difficult to find the K575 model in brick-and-mortar retailers any more. Even Keurig themselves have perpetually labeled the model “out of stock” on their own site. There’s no loss of third-party retailers all over the web with K575’s just burning a hole in their inventory, and if you can find one at a good price, go for it. But seeing as how Keurig brand water filters are relatively easy to find (and a worthy investment, especially if you have hard water), and that the units themselves are identical, then rest assured that the K525 is every bit as worthy of your hard-earned money as the other model. And know that, no matter which brewer you ultimately settle upon, you’ll be getting a premium machine in every sense of the word. It’s not clear why a water filter is touted as a remedy for hard water… typically, charcoal filters don’t remove calcium and the docs simply say that the water filter removes chlorine.